Mr Mohd Shahril Izuan, born in Pahang, Malaysia, graduated from National University of Malaysia (UKM) in April 2002 with B.Eng in Communication & Computer Engineering. He obtained M.Eng in Communication & Computer Engineering from the same university in August 2004. 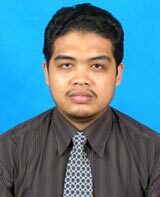 He joined Universiti Teknikal Malaysia Melaka (UTeM), first as an assistant lecturer on June 2002 and then as a lecturer on September 2004. During this period, he delivered courses in microprocessor, computer network and data communications for undergraduate students. He was also involved in several research projects in the area of wireless communications. He is currently doing his PhD in Ultra Wideband Communications at University of Salford. Kok Swee Leong, Mohd Shahril Izuan. (2006) “Ion-Exchange Technique for Directional Couplers Fabrication on Glass Substrate”. Proceedings of REACH’06, Research Achievement Seminar KUTKM, Penang, Malaysia. Kok Swee Leong, A.B.M. Shafiul Azam, Mohd Shahril Izuan. (2005) “Ion-Exchange Technique for Directional Couplers Fabrication on Glass Substrate”. Proceedings of ISAPS’05: Advances in Applied Plasma Sciences, Vol.5. The 5th International Symposium on Applied Plasma Science, Hawaii USA. Mohd Shahril Izuan b Hj Mohd Zin. (2004) “Developing And Testing Of Mobile Internet Content Using Extensible Hypertext Markup Language Mobile Profile (XHTML-MP)”. Masters Degree Thesis. National University of Malaysia (UKM). Mohd Shahril Izuan b Hj Mohd Zin. (2002) “Cellular Radio System Coverage Prediction in National University of Malaysia”. Bachelor Degree Thesis. National University of Malaysia (UKM).